Normal service will resume with Weeks Seven & Eight essential purchases rolled up into a bumper posting next week. In the meantime here's a classic from Spandau Ballet. Here we are at week six of the year (already!!?!!?) and I've sold more records than I've actually bought. Wow. In fact I've probably spent so far in 6 weeks on records what I used to spend in a week. Wow. Anyways there appears to be a veritable treasure trove of good music out this week so without further ado let's have a little rummage around. First things first there is of course the new single from They Came From The Stars I Saw Them out on black plastic this week. 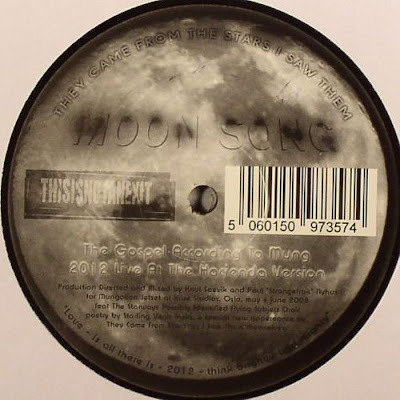 The new Moon Song 12" features not only the album version but also a remix from Serge Santiago (he used to be in Radio Slave, has remixed Goldfrapp and Hercules & Love Affair, and also runs the rather excellent Arcobaleno Records) called "Serge Santiago's Totally Different Mix". There is also a remix from Norway's finest disco export Mungolian Jetset called entertainingly "The Gospel According To Mung 2012 Live At The Hacienda Version" which means that either in 3 years time the block of flats on the Hacienda site will have been knocked down and the ghost of Tony Wilson will have resurrected a nightclub that plays music of the past and the future. Or Pal from Mungolian Jetset plans on moving into a Hacienda flat in a few years time once he's saved up. Anyway there should be some sort of launch party in a flat in the Hacienda. I even had a little look to see if it was possible. See. You probably didn't believe me. Anyways they wouldn't let me rent it out for just one month. We could have had Mungolian Jetset vs. They Came From The Stars I Saw Them MOON SONG parties 30 days in a row!! Imagine that. Anyways you can buy it from your local record shop. Whether that be one of the few remaining ones on the ghost town that is the high street (like Rough Trade) or via one of those new fangled online retailers. Like Juno. Owing to the fact that I already have a copy of the Moon Song 12" I instead will be buying a copy of this little beauty from BIG NED on Optimo Music. The Optimo.Singles.ClubAnd.Related.Recordings or OSCARR appears to have ended and replaced with Optimo Music and this is the first release. It doesn't take much to sell this to me. Optimo have the best taste in music in the world BAR NONE and thus you know you need this single. There's only 500 of them IN THE WORLD and it sounds like David Lynch jamming with Nick Cave and The Bad Seeds in the dirty basement of the black lodge. Proper raw this is. Grab a whisky and sit back. Also out this week and worth having a listen to is the new 12" from Mike Simmonetti's cooler than cool Italians Do It Better label. It's a new artist by the name of BOTTIN and is called No Static. There are 750 of these 12s pressed and if you want a piece of black plastic for gliding round your warehouse apartment to in a slo-mo-italo-groovy-disco fashion then this will probably float your boat more than the SCARY Big Ned. In other news Detachments are playing the Proud Galleries this Thursday evening which should be a rather glorious evening of live music. We have a special £4 concessions list for this event so if you want to come along and catch the band just let use know via email / facebook / myspace. 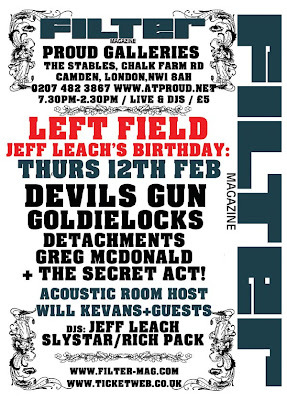 Detachments are onstage around 9pm. Oh and my tip for record you should not even consider buying? 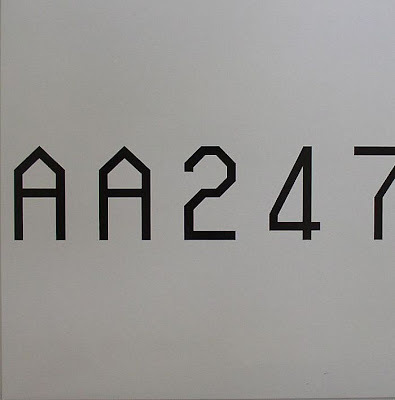 This thing called AA247. I watched the video on youtube and was astounded at how bad this is to say how much hype it has had. Seriously this will be 50p on ebay in about 3 months. A novelty piece of crap. Save you money folks and buy something deserving of your hard earned. Sideshow - If Alone (Chateau Flight Remixes / Appleblim & Kozmonazmuk Remix) (Aus) 12"
The Appleblim & Kozmonazmuk Remix has been getting some major support - and backed up with two Chateau Flight Remixes this looks like good value for money! Cage & Aviary - Television Train (DFA) 12"
For those that didn't get Television Train when it came out on Dissident a while back then snap this up without fail. One of the best things to come out on Dissident and now comes with new track Suburban. I may well buy Suburban on an mp3 though seeing as I've already got Television Train though. 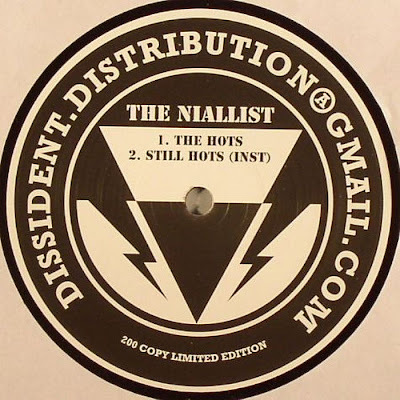 Speaking of Dissident the new 12" from The Niallist is also on my list. Previews over at the myspace page. I think that's it. I might also buy The Village Orchestra 12" with the 2562 remix but need to properly check that out. Or maybe I'll just listen to some Ministry all weekend. I'll be checking all these out this weekend. I'll write some more interesting things soon - honest.